An airline captain and therapist presents SOAR; the uniquely effective program that conquers flight anxiety. Captain Tom Bunn founded SOAR to develop effective methods for dealing with flight anxiety. Therapists who found this phobia difficult to treat with find everything they need to give their clients success. Anxious flyers who have "tried everything" to no avail can look forward to joining the nearly 10,000 graduates of the SOAR program who now have the whole world open to them as they fly anxiety free wherever they want. This approach begins by explaining how anxiety, claustrophobia and panic are caused when noises, motions -or even the thought of flying -trigger excessive stress hormones. Then, to stop this problem, Captain Bunn takes the reader step-by-step through exercises that permanently and automatically control these feelings. He also explains how flying works, why it is safe and teaches flyers how to strategically plan their flight, choose the right airlines, meet the captain and so on. I’ve tried everything. I’ve read two books. I went to a therapist. I tried hypnosis. My doctor said drugs would help, but they don’t. I know these things work for other people. But they don’t work for me. Doubt seems to be an integral part of flight phobia. If you’ve tried to deal with fear of flying and not been successful, you didn’t fail. Inadequate methods failed you! For example, fearful fliers are given statistics about the safety of air travel. Statistics don’t help. They zero your thoughts in on flights that became statistics. Friends say, “Just keep it out of your mind.” But how? Pilots believe you just need to understand how safe flying is. They offer courses, sometimes with the help of a psychologist who offers relaxation exercises. The combination is far from satisfactory. When pilots say flying is safe, they mean accidents are rare. It doesn’t matter how many millions of flights arrive safely. Planes do crash. That is a fact, and the anxious flier has no guarantee that his or her flight is not going to be the rare one that crashes. Though they work well on the ground, relaxation exercises produce no reduction of anxiety in the air. Courses typically measure their success rate by the percentage of participants who take the graduation flight. But since most people who take these courses can fly, but do so with great difficulty, a ninety or ninety-five percent “success rate” means very little. What is telling is the number of course participants who are able to fly six months later: It is almost the same as the number who could fly before the course. They basically taught me how to relax, explained the mechanics of flying, and tried to desensitize me to being in an aircraft. I took the several week course and made the graduation flight, but that was it. I really didn’t learn any skills to deal with my fear of flying afterwards. After this, many years passed without attempting to fly. My recent motivation to fly again was one of my sons was doing what I had done in college; he was studying architecture in Florence, Italy. My wife—an avid flier—planned to visit him with or without me. I desperately wanted to make this trip happen. I bought the SOAR Program and started watching the videos and practicing the Strengthening Exercise. I bought refundable tickets and scheduled a short flight with my wife. I made the decision to go to the airport. I would decide at the airport whether or not to fly. The airport was very quiet on a Saturday morning. We went through security and got to the boarding gate. I froze. I was devastated. Though I had done what I committed to—to go to the boarding gate and then decide—I was furious with myself that I had not taken the flight. Anger turned into commitment. I went home and was determined to fly on the following Monday no matter what. I went to the airport by myself and boarded a Southwest flight to Baltimore-Washington. I gave my SOAR letter of introduction to the flight attendant and he introduced me to the captain. The airline was great and I had my first flight on an airliner in twenty-three years. Now I needed to prepare for my flight to Europe. I was extremely concerned about the flight overseas, first to Paris, and then on to Florence. I discussed my apprehension about such a long flight with Captain Tom. He said that most people prefer longer flights because after the initial maneuvering, you have a chance to relax while cruising. He said to bring a lot of things to do, and not to depend solely on the airline for entertainment. I continued with my Strengthening Exercises. I was able to meet the pilots; they were fantastic. Meeting the pilots makes a world of difference. Whenever I heard a noise, I could picture their faces knowing what it was, and doing what they needed to do about it. To make a long story short, the flights went well and we had a great trip and visit with my son. In order to be successful in any aspect of your life you need to be fully committed and be willing to work hard to achieve your goals. The key is to work hard in the right direction. Captain Tom and SOAR gave me that direction. It was nice to know that I am not so different than everyone else. Fear of flying courses, like the one this architect took, were introduced at Pan Am and US Airways around 1975. They were helpful only if a person’s flight difficulties were mild. I worked as a volunteer on the course at Pan Am. It disturbed me that many on the “graduation flight”—though they were using the techniques we had taught them—suffered massive anxiety or panic. Information about safety was not enough. Relaxation exercises did not work. For every person these well-intended courses have helped, another person has been left feeling that they are very different and terribly flawed. The course that failed Harold impacted his life for twenty-three years. Such a failure—through no fault of his own—can affect a person for the rest of his life. 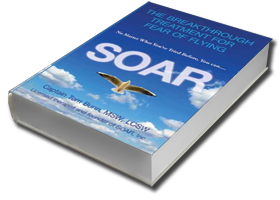 When I established SOAR, no one had broken the code on how to treat flight phobia. I thought that by being both an airline captain and a licensed therapist, perhaps with enough study, I might be able to do it. Through work with thousands of clients, and by studying how the mind works, I found a way to control high anxiety, claustrophobia, and panic by inhibiting the release of stress hormones. At this point, SOAR is more than a fear of flying course. It is the most advanced method of treating flight phobia.